We design and develop Scroll Roll up Stand with heavy base and banner roll modules. 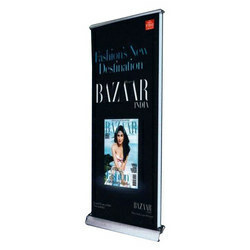 The Roll up banner stands have collapsible sides, due to which, these are easily accessible from one place to another. While responding to the emerging requirements of the market, we have been providing Promotional Scrollers that is in huge demand among patrons. These Heavy Roll Up Banner Stands are often used in exhibitions, trade shows and product launches for displaying products. Also used as hotel foyer welcome signs and reception area signage, these portable banners can be conveniently placed anywhere. Kasturi Art offers scroller. These scroller made of waterproof nylon and tetron material to resist the weather and can be made in to order sizes. These can be screen printed as per design. These scrollers provide a professional stage for various companies to present their products, gain more potential customers and increase their presence in market. Our Production is built to most modern Design. Backed by rich industry experience, we are able to manufacture an unmatched range of Scrolling Banner Stand using latest technology. These are acclaimed for its eye-catching look, clear visibility and low maintenance. These are customized on various parameters to achive the complete trust of our clients. Our customers can avail from us a wide-ranging range of Scroll Banner Board. Professionals make this product in diverse sizes that meet on client’s demand. Our Standard L Banner Stands are made using qualitative raw materials and hence are highly durable and efficient. We offer our Standard L Banner Stands in standard sizes and according to the specifications provided by the customers.L Banner Stands / Tension banner stands are a great way of displaying yourexhibition graphics. We have marked a distinct and dynamic position in the market by providing a high quality array of Scrolling Standee. You also can see your banner in our banner scroller below the main banner, its small in it's size but because it is scrolling automatically it can impact better in visitors mind.